Background: Two of the most critical factors affecting the prognosis of an avulsed tooth after replantation are extra oral dry time and the storage medium in which the tooth is placed before treatment is rendered. However, the ability of a storage/transport medium to support cell viability can be more important than the extra oral time to prevent ankylosis and replacement resorption. Aim: Purpose of this study was evaluation and comparison of efficacy of a new storage medium, oral rehydration solution (ORS) with coconut water, and propolis in maintaining the viability of periodontal ligament (PDL) cells by using a collagenase-dispase assay. Materials and Methods: 40 teeth were selected with intact crown which were advised for Orthodontic extraction having healthy PDL. Teeth were then randomly divided into three experimental storage solution groups. Other 10 were divided into positive and negative control groups (5 each). Statistical Analysis and Result: The results were statistically analyzed with analysis of variance and multiple range by using post hoc tests. The results of the prevailing study indicated that coconut water group demonstrated a significantly higher number of viable PDL cells than propolis 50%, and ORS. There was no significant difference between coconut water and propolis 50% groups. Avulsion injury, one of the most severe forms of dental trauma, is characterized by complete displacement of the tooth from its alveolar socket. Because of the complexity of avulsion, neurovascular supply is severely compromised and usually results in loss of pulp vitality. A vital periodontal membrane (PDM) has been found to be of ultimate importance for the successful healing of replanted teeth. Propolis, a substance obtained from the honeybee extract, is a potent antimicrobial, antioxidant, anti-inflammatory, antibacterial, antifungal, antiviral, and tissue regenerative agent. In general, propolis is composed of 50% resin and vegetable balsam, 30% wax, 10% essential and aromatic oils, 5% pollen, and 5% various other substances including organic debris. Martin, Pileggi and Φzan et al. found propolis to be a superior transport medium to HBSS or milk in terms of maintaining periodontal ligament (PDL) cell viability after avulsion. The biologically pure, tender coconut water is readily accepted by the body because it is sterile and thus, used as a blood plasma substitute. Gopikrishna et al. found that coconut water was superior to HBSS or milk in terms of maintaining PDL cell viability after avulsion and storage. Hence, the purpose of this study was evaluation and comparison of efficacy of three different storage medium-ORS, coconut water and propolis in maintaining the viability of PDL cells by using a collagenase-dispase assay. 40 teeth were selected with intact crown and close apices which were advised for orthodontic extraction having healthy PDL. After a traumatic extractions, the teeth were held with forceps from the coronal region, and the coronal 3 mm of PDL was scraped with a curette to remove cells that might have been damaged. Positive and negative control groups consisted of five samples each. Freshly open tender coconut water was used for each sample. Propolis was made into 50% concentration using 0.4% ethanol solution. Propolis 50% was prepared by adding 50 mg ground propolis per 250 ml of the 0.4% ethanol solution. Before submersion of teeth in propolis, solutions were shaken for 15 minutes. 1 teaspoon of ORS powder was taken in 200 ml (one glass) of distal water and stirred. New experimental solution was made every time. Teeth in experimental groups were dried for 30 minutes (including time taken for curetting coronal PDL cells), followed by a 45-minute immersion in one of the three storage solution groups. The teeth in positive control group after extraction was immediately treated with dispase and collagenase. The teeth in negative control group were bench-dried for 8 hours, with no follow- up storage solution time, and then placed in the dispase and collagenase. After drying and soaking of each experimental teeth, 2.5 ml of stock solution containing grade II dispase and collegenase were added to teeth and incubated for 30 min at 37°C. After incubation, 50 μL of fetal bovine serum was added to each tube with help of micropipette. All tubes were then centrifuged for 4 minutes at 1000 rpm and supernatant was removed with sterile micropipettes. The cells were labeled with 0.4% trypan blue for determination of viability. The number of viable PDL cells was counted under light microscope with hemocytometer at 40× magnification. 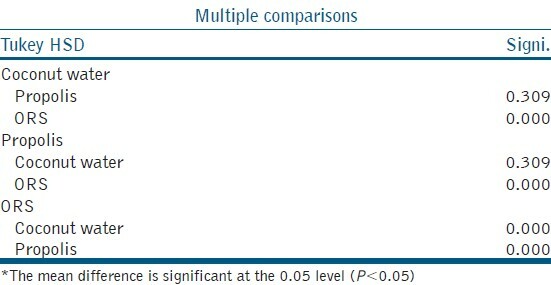 Results were statistically analyzed using analysis of variance and post hoc tests [Table 1]. The level of significance was 5% (P < 0.05). Statistical analysis showed a significant difference among the groups. Tukey test showed significantly higher number of viable PDL cells in coconut water group than propolis 50% and ORS. There was no significant difference between coconut water and propolis 50% groups. However, both coconut water and propolis 50% groups demonstrated a significantly higher number of viable PDL cells than ORS [Table 2]. All experimental solution groups were significantly lower than positive control and higher than negative control group. Avulsion injuries are the worst of dentoalveolar injuries. Usually, avulsion involves single tooth, and the most frequently avulsed tooth is maxillary central incisor. This study focused on evaluation and comparison of efficacy of three different storage media-ORS, coconut water and propolis in maintaining the viability of PDL cells by using a collagenase-dispase assay. Also Ozan et al. evaluated the effect of propolis on survival of PDL and found propolis to be a superior transport medium to HBSS or milk in terms of maintaining PDL cell viability after avulsion and storage. The results of the prevailing study indicated that coconut water group demonstrated a significantly higher number of viable PDL cells than propolis 50%, and ORS. There was no significant difference between coconut water and propolis 50% groups. Ideal requirements for a storage media as suggested by Blomof  are 290-330 mOsm/L and a pH of 6.6 to 7.8. Even though the osmolarity of ORS is comparable the pH is significantly less than the ideal which may be the reason for the comparatively lesser number of viable PDL cells in this study. It remains to be explored, whether the modification of ORS by addition of common day to day product could increase its pH to the required level to optimize its efficacy as storage media. 1. Lee JY, Vann WF Jr, Sigurdsson A. Management of avulsed permanent incisors: A decision analysis based on on changing concepts. Pediatr Dent 2001;23:357-60. 2. Blomlöf L, Lindskog S, Andersson L, Hedström KG, Hammarström L. Storage of experimentally avulsed teeth in milk prior to replantation. J Dent Res 1983;62:912-6. 3. Gopikrishna V, Baweja PS, Venkateshbabu N, Thomas T, Kandaswamy D. Comparision of coconut water, propolis, HBSS, and milk on PDL cell survival. J Endod 2008;34:587-9. 5. Ozan F, Polat ZA, Er K, Ozan U, Deðer O. Effect of propolis on survival of periodontal ligament cells: New storage media for avulsed tooth. J Endod 2007;33:570-3. 6. Al-Shaher A, Wallace J, Agarwal S, Bretz W, Baugh D. Effect of propolis on human fibroblasts from the pulp and periodontal ligament. J Endod 2004;30:359-61. 7. Campbell-Falck D, Thomas T, Falck TM, Tutuo N, Clem K. The intravenous use of coconut water. Am J Emerg Med 2000;18:108-11. 8. Gopikrishna V, Thomas T, Kandaswamy D. A quantitative analysis of coconut water: A new storage media for avulsed teeth. Oral Surg Oral Med Oral Pathol Oral Radiol Endod 2008;105:e61-5. 9. Blomlöf L. Storage of human periodontal ligament cells in a combination of different media. J Dent Res 1981;60:1904-6. 10. Hiremath G, Kidiyoor K. Avulsion and storage media. Inves and Clinical Dent 2011;1-6. 12. Al-Nazhan S, Al-Nasser A. Viability of human periodontal ligament fibroblasts in tissue culture after exposure to different contact lens solutions. J Contemp Dent Pract 2006;7:37-44. 13. Chamorro MM, Regan JD, Opperman LA, Kramer PR. Effect of storage media on human periodontal ligament cell apoptosis. Dent Traumatol 2008;24:11-6. 14. Almas K. Propolis as a natural remedy: An update. Saudi Dental Journal 2001;13:1. 15. Highmedia-Collegenase and dispase enzyme product description. Available from: http://www.e-labdoc.roche.com/LFR_PublicDocs/ras/10269638001_en_13.pdf. [Last accessed on 2011 Jul 08]. 16. Sigma FETAL BOVINE SERUM (FBS) Product Numbers F2442, product description. Available from: http://www.sigmaaldrich.com/etc/medialib/docs/Sigma/Product_Information_Sheet/f2442pis.Par.0001.File.tmp/f2442pis.pdf. [Last accessed on 2011 Jul 21]. 17. Technical Reference Guide Protocol for Performing a Trypan Blue Viability Test. Available from: http://www.bio.lonza.com/uploads/tx_mwaxmarketingmaterial/Lonza_BenchGuides_Protocol_for_Performing_a_Trypan_Blue_Viability_Test.pdf. [Last accessed on 2011 Aug 23]. 18. Giuseppe S. A. Longo-Sorbello, Guray Say&m, Debabrata Banerjee, and Joseph R. Bertino. Cytotoxicity and Cell Growth Assays, cell and tissue culture: assorted techniques;2006:315-324, Elsevier Science (USA). 19. Immunocytometry solution-Hemocytometer Counting and Cell Viability. Available from: http://www.groups.molbiosci.northwestern.edu/morimoto/research/Protocols/II.%20Eukaryotes/A.%20Cell%20Culture/3b.%20Hemacytometer.pdf. [Last accessed on 2011 Jul 23]. 20. Kenny DJ, Barrett EJ, Casas MJ. Avulsions and intrusions: The controversial displacement injuries. J Can Dent Assoc 2003;69:308-13. 21. Singla A, Garg S. Reimplantation: Clinical implications and outcome of dry storage of avulsed teeth. J Clin Exp Dent 2010;2:38-42.